KFTC is working for a day when discrimination is wiped out of our laws, habits, and hearts. 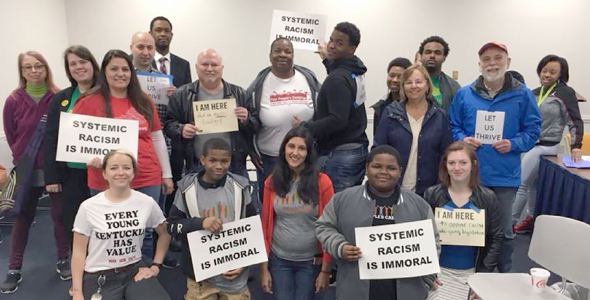 KFTC's Racial Justice Committee helps ensure the organization is incorporating racial justice and anti-oppression into all of our work and strategies. The Racial Justice Committee’s work includes informing the membership on issues affecting racial justice, coordinating education and skill-building opportunities, and ensuring that racial justice principles are applied to all areas of KFTC’s program of work in an intersectional way. The Committee helps ensure KFTC is being a good ally and is working in solidarity with other organizations on these issues.